Supposing you have a truckload of downloaded MP4 movies in foreign language, but the devoid of subtitles in these movies drives you on the verge of collapse. Have you ever created your own movie with your recordings but found your clips are difficult to understand? One feasible solution is to add subtitles to MP4 video file. At the very beginning of the task, a professional MP4 subtitles merger is deemed as part and parcel to embed SRT subtitles into MP4 movies and recordings. Well, here MacX Video Converter Pro is highly recommended to you to complete this SRT subtitles to MP4 adding task. This MP4 video converter for Mac software not only helps to merge SRT subtitles with MP4 file but also supports adding external subtitles to AVI, FLV, MKV, WMV, MOV, MP4 and any other mainstream video formats within a few clicks. Below we will show you how to add subtitles to MP4 file on your Mac OS X using the SRT to MP4 merger. MacX Video Converter Pro - super fast put external SRT subtitles to MP4 video, AVI, MKV, MOV, FLV, etc. without encoding video/audio, less than 1 min, thanks to its advanced Intel Quick Sync Video/Nvidia/AMD hardware acceleration tech. This part is available for people who do not have any .srt subtitles or who want to add some of their own words to the .srt subtitles displayed onscreen. If you have saved SRT subtitles you need, just skip this part and directly move to part 2 to add subtitles to an .mp4 movie. Download SRT subtitles: You can put "movie title" + "your preferred language" + "subtitles" as the search strings and select the subtitle file saved in .srt for an effective SRT subtitle file searching. Alternatively, finding the needed subtitles in .srt format from those popular subtitle download sites like Moviesubtitles.org is also a practical way. 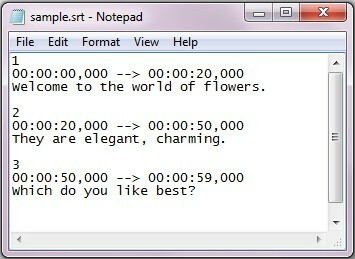 Edit or make your own .srt file: Here we take Notepad as an example. Just open Notepad, create the subtitles you like in the text editor, click menu File -> Save As; change the subtitle file name based on your name of video file and save it in .srt format. 4. A blank line indicating the begin of a new subtitle. Once the .srt file you need is saved on your Mac OS, you just commence the SRT subtitles to MP4 merging with the aid of mp4 video converter. Step 1: Free download, install an run this subtitles to MP4 merging software on your Mac, import the source video by clicking "Add File" button. You can also add more than one video files at a time. Step 2: Choose the output format as you like. Hit Mac General Video -> MP4 Video (MPEG 4 or H264) as the output format. Step 3: Click "Edit" button on the main interface of this software. Then the "Edit" window pops up. Here just hit "Enable subtitle" -> "External Subtitle File" and click "Add" button to choose the .srt file you've saved on your Mac. Move the mouse to "Done" button and click it to finish to add subtitles to MP4 video. On top of combining SRT with MP4, it also has the ability to remove SRT subtitles from MP4, as well. Note: Please make sure that the names of the MP4 file and the subtitle file are matched. For instance, if the movie file is saved as "Skyfall.mp4", you must ensure the name of the subtitle file to be saved in "Skyfall.srt". Step 4: Hit the "RUN" button to start hardcoding .srt language subtitles to MP4 video on your Mac OS X. After a few seconds, you can watch your MP4 movies or recordings with your preferred language track from the .srt file. 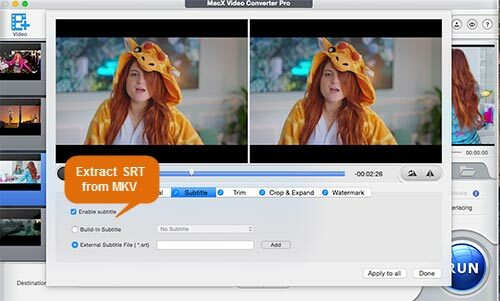 Please note that to add subtitles to MKV, MP4, AVI, WMV and other video file is only one excellent function in MacX Video Converter Pro. With it, you can convert among any videos, like MKV to MP4, YouTube to iPad Mini 4/Pro, AVI to iPhone Xs/Xs Max/XR, etc, so that you can not only enjoy your video file on the go but also upload your recorded clips to YouTube with preferred language. Please note that this SRT subtitles to MP4 merger is especailly designed for Mac users and is fully compatible with Mac OS X 10.5 and later, including the latest macOS 10.14 Mojave. For windows users, please get a download of its Windows version for free to embed subtitles into MP4 file.